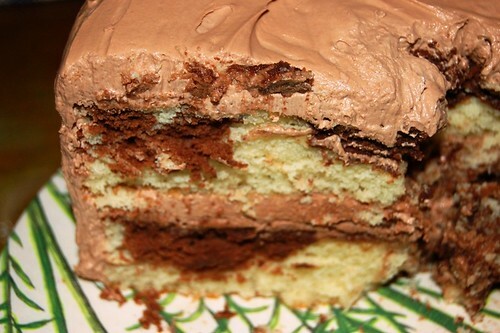 Marble cake is perfect for the indecisive. When chocolate and vanilla hold hands, you get a little bit of both on your fork – no need to choose. Cover the whole thing in a light, pillowy chocolate buttercream, and you’ve got yourself one classic birthday cake. When using chocolate to flavor batter and frosting, always use the best chocolate you can find. 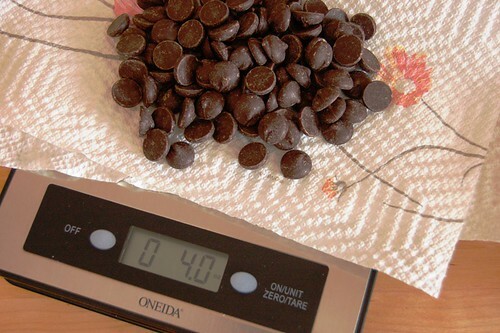 I used Ghiradelli 60% cacao bittersweet chips…perfectly measured on my new kitchen scale! 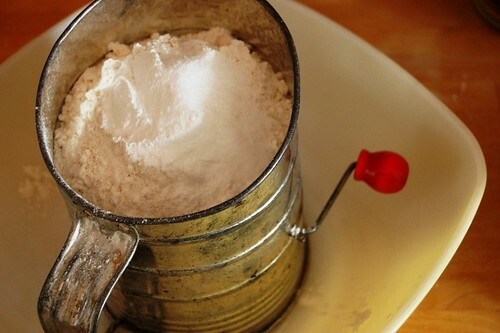 When using dry ingredients, sift them before using to remove any lumps. I love my vintage sifter… It honestly works better than newer models. 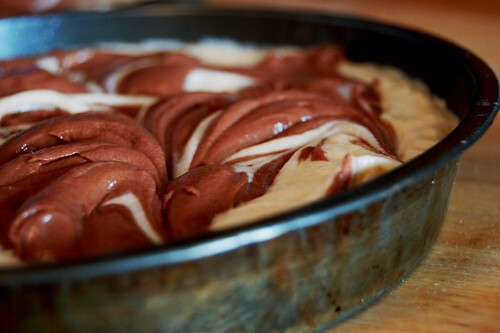 For marble cake, separate a portion of the vanilla batter and flavor it with melted chocolate. 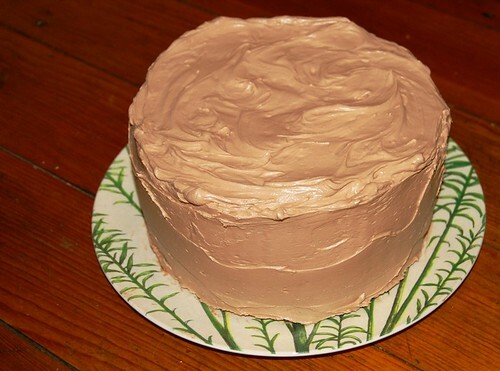 Once baked and cooled, envelop the finished cakes in a lighter-than-air chocolate buttercream. Sing, clap, and pass around the plates. A messy cake is a successful cake. 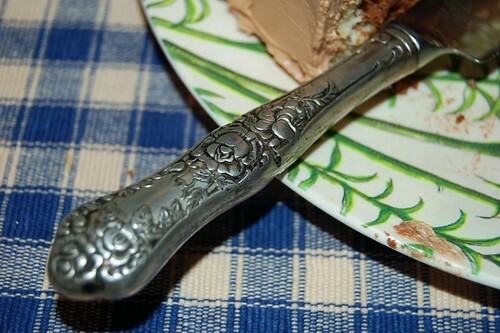 I adored the cake knife, with its ornate rose handle. 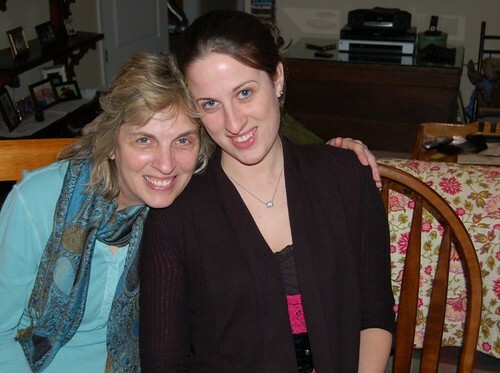 And I love my mom and sister Tara, the beautiful birthday girls! Thank you for letting me make your birthday cake! Preheat the oven to 350 degrees. Grease/flour two 9 inch round cake pans. For best results, place a circle of parchment in the bottom of the pan, and grease/flour the parchment as well. In a medium bowl, sift together flour, baking powder and salt. In a cup, combine milk with vanilla. Set both aside. In a large bowl or in the bowl of a stand mixer fitted with the paddle attachment, beat the butter at medium speed until light and smooth. Add the sugar. Cream butter and sugar together until fluffy – around 4 minutes. Add the egg yolks one at a time, stopping after each addition to scrape the sides of the bowl with a rubber spatula. Add the dry and wet ingredients alternately, in three batches. Transfer 2 cups of batter to a small bowl and set aside. Scrape the remaining batter equally into the 2 prepared cake pans. Add the melted and cooled chocolate into the reserved batter and stir until smooth. Place heaping spoonfuls of the chocolate batter on top of the vanilla batter, and swirl the two together with a butter knife. 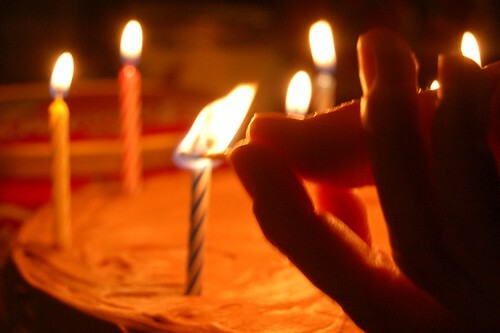 Bake the cakes for 35-40 minutes, or until a toothpick inserted into the center comes out clean. Cool the cakes for 15 minutes on a wire rack. Run a knife along the edge of the pan to loosen the cake, then invert each onto the wire rack to cool completely. In a large bowl or in the bowl of a stand mixer fitted with the whisk attachment, beat the butter and egg yolk at medium speed until creamy. Reduce speed to low and add powdered sugar. Mix until combined, then add 6 tablespoons of the cream, vanilla, and salt. Increase speed to medium-high and beat until fluffy – around 3 minutes. 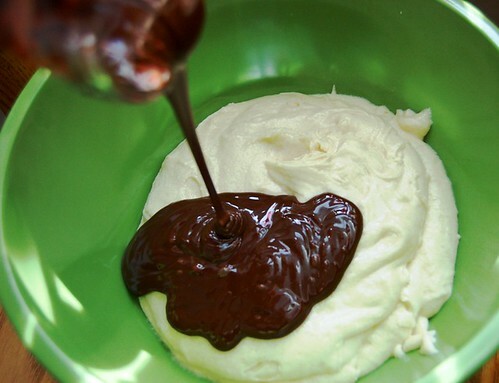 Place the rest of the cream in microwave-safe bowl and add the chopped chocolate. Microwave for 20 seconds at medium power level, then whisk together. Repeat process until chocolate and cream are smooth. Allow to cool for a few moments. Once cooled, add melted chocolate to the buttercream and beat until combined. Place 1 cup of buttercream on top of one of the cake layers, stack the remaining layer on top, then frost the top and sides. Lick the bowl. Nobody is looking – it’s alright. Such a gorgeous cake, the icing makes it look luscious! Aimee love love love reading your blog. I wish i lived closer to you to taste everything. I love your new background (!) but did I read correctly that you will change your website name?! WHAT?! Hahaha, jk! Bring on the changes, I think it will just make everything better! Oh man. I want some of that cake! It’s definitely drool-worthy. I’m sure the birthday girl loved it! I WOULD, Julie! I keep telling my family “I take requests!” If someone will get it out of my kitchen (and away from my snacking hands) then I will gladly supply it. Haha. I know you don’t need any help, though…you’re a pro! waow !! what a delicious cake !! and I love your old sifter !! made this cake, so delish! thanks for sharing it. made it for my mothers bday, and she was thrilled! The cake looks gorgeous. And SUPER delicious, the buttercream frosting is giving me food envy. The cake looks amazing 🙂 I have been looking for a sifter like that FOREVER. My mom has one and I love it. But I haven’t had any luck finding one, so if you see another one, let me know. Oh my gosh this looks delicious. The frosting looks exactly like a frosting I learned to make from my friend’s mom who’s from Georgia. It’s one of the best frostings I’ve ever had.